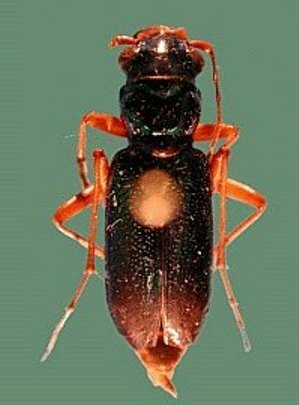 Region: This beetle is found in the western region of North America. However, there are similar species found in the South and throughout North America. Life cycle: This beetle overwinters in the soil as adults and larvae. The entire life cycle of the this beetle takes two to three years to complete. Physical Description: These 3/4 inch beetles are distinguished by their flashy, iridescent hues of blue, green, bronze, and purple. They have long legs and are strong fliers. The eggs are laid one at a time in burrows within the soil. The larva is white and S-shaped with heavy spines and a hump in the middle of the body with curved hooks. Feeding characteristics: Both the adult and the larvae feed during the day on many plant eating insects. 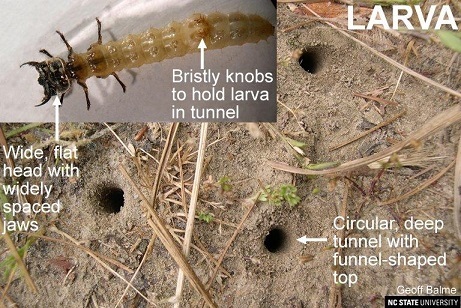 The larvae spend time at the bottom of tunnels, waiting for an insect to stumble in.